Kerokero Ace (ケロケロエース, Kerokero Ēsu) was a Japanese shōnen manga magazine published in Japan by Kadokawa Shoten. The magazine was aimed at boys between 9 and 13 years old. It was directly focused on the Sgt. Frog series and other works promoted by Bandai such as Gundam. The magazine contains manga comics, computer game reviews, merchandise promotions and gifts. The magazine was focused primarily on the series Sgt. Frog, containing features, promotions and a new manga. The manga saw Keroro and his allies sent to an alien world which resembles feudal Japan. They are tasked with attempting to bring order to it. The magazine's secondary focus was Gundam. Similar to Sgt. 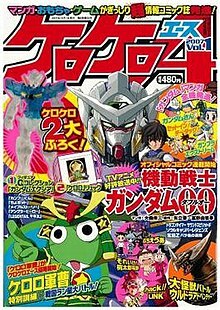 Frog, the magazine contained much promotion of its related merchandise and four of the comics running were Gundam titles. These included an adaptation of the television series Mobile Suit Gundam 00, latest chapters of SD Gundam and GPEX Gunpla Extreme, in which humans use special gadgets to shrink down and turn Gundam models into working miniature mecha. The remainder of titles printed in the magazine alternated between comedy adventure gag comics and further promotional tie ins. These manga series were carried by the magazine. Keroro Gunsō Tokubetsu Kunren: Sengoku Ran Star Dai Battle! Due to its role of promoting Bandai projects, the title was linked to similar magazines such as Hobby Japan and Dengeki Hobby. The title also included popular comics which run in Gundam Ace; it was also a special edition of Gundam Ace. Similar to many Shonen magazines (Shonen Ace, Monthly Shonen Sunday), Kerokero Ace often included 'gifts' to increase interest. Such items were usually linked to the comics that ran within the title or exclusive collectables. Items offered included Haro digital watches, Keroro stickers and kaiju trading cards. This page was last edited on 2 July 2018, at 21:24 (UTC).